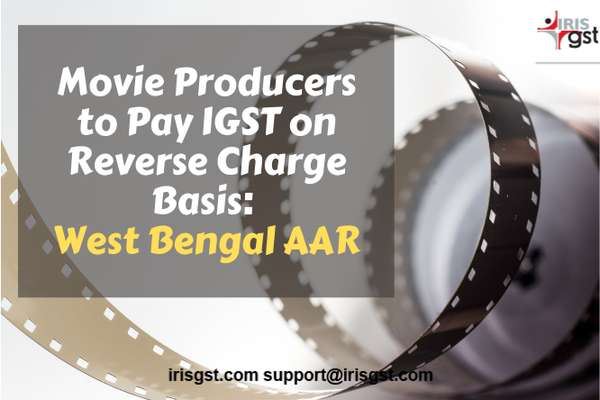 WEST BENGAL AUTHORITY FOR ADVANCE RULING in case of “Udayan Cinema Pvt Ltd” held that The producer of a feature film is liable to pay IGST on reverse charge basis on payment made to a line producer engaged in Brazil. The applicant intends to produce a feature film, a portion of which is planned to be shot at locations outside India. For this purpose, he is in the process of appointing CDI Virtual Films Inc. (hereinafter the CDIVF) as a Line Producer in Brazil. CDIVF is supplying namely accommodation for the crew, supply of food, props, and ancillary services like renting of shooting locations etc. Applicant argued that CDIVF is acting as a pure agent with respect to the services from the foreign suppliers that the Applicant reimburses on an actual cost basis. According to rule 33(iii), the supplies procured by the pure agent are in addition to the services he supplies on his own account. Applicant further argues that the service of CDIVF can also be classified as event management service, as described under section 13(5) of the IGST Act, 2017. The shooting of the film in foreign locations, resulting in the emergence of a CD containing the filmed materials, is an „event? that CDIVF is going to organize and manage. The Applicant argues that the service being that of an intermediary or else of an event manager, it fits the description of the services covered under sub-sections (3) to (13) of section 13 of the IGST Act, 2017. The place of supply of the service provisioned from CDIVF is, therefore, the location of the supplier in terms of section 13(2) of the IGST Act, 2017. The location of the supplier being in Brazil, the place of supply is not in India, and the transaction is not „import? within the meaning of section 2(11) of the IGST Act, 2017. The transaction with CDIVF does not, therefore, constitutes an inter-state supply within the meaning of section 7(4) of the IGST Act, 2017. No tax, therefore, is payable under Notification No. 10/2017 – IGST (Rate) dated 28/06/2017. Concerned officer from the Revenue submits that at the time of signing the Contract the so-called principal suppliers of the services or the services are not clearly identified. The Question of facilitating as an intermediary between the principal suppliers and the recipient, therefore, does not arise. CDIVF is, not, therefore, acting as an intermediary. The answer to the question about the liability to pay IGST on the reverse charge on the payments to be made to CDIVF depends upon the location of the recipient of the service. The Applicant, a resident of India, will receive the service in Brazil, where it has no fixed establishments or a specific location at which the service is being supplied. The location of the recipient should, therefore, be the usual place of his residence in terms of section 2(14)(d) of the IGST Act, 2017. The recipient is, therefore located in the taxable territory. Tax is, therefore, payable on RCM in terms of Sl No. 1 of Notification No. 10/2017 – IGST (Rate) dated 28/06/2017, provided the transaction constitutes an inter-State supply within the meaning of section 7(4) of the IGST Act, 2017. A Line Producer is a key member of the production team for a motion picture. Typically, a Line Producer manages the budget of a motion picture. Alternatively, or in addition, they may manage the day to day physical aspects of the film production, serving a role similar to the „unit production manager?,also hire key members of the crew, negotiate deals with vendors, and is considered the head of the production. supervises the preparation of the film's budget and is in charge of all the business aspects of the physical production of the film. During pre-production, Line Producers, working closely with the director, production manager, first assistant director, art director and other heads of department, prepare the production schedule and budget and set the shoot date. Line Producers oversee all other preproduction activities, including hiring the production team, setting up the production office, location scouting, ensuring compliance with regulations and codes of practice, sourcing equipment and suppliers, selecting the crew, engaging supporting artists and contributors, and monitoring the progress of the art department and other production departments. Line Producers are ultimately responsible for overseeing all activities, and for ensuring that the production is completed on time and within budget. Advance ruling says It is evident from the above discussion that a Line Producer?s job is not limited to arranging hotel accommodation, catering for the filming crew, local transportation and procuring location permits on behalf of the principal. His service is, therefore, an integral part of the activity for the production of the feature film. The Applicant is liable to pay IGST on the payments made to the above Line Producer in terms of Sl No. 1 of Notification No. 10/2017 – IGST (Rate) dated 28/06/2017at 18% rate specified under Sl No. 34(vi) of Notification No. 08/2017 – IT (Rate) dated 28/06/2017, as amended from time to time. No deduction is available in terms of the contract with the Line Producer appended to the Application from the value of the supply of motion picture production service even if payment is made on an actual cost basis. However, if the Applicant modifies the contract so that the Line Producer acts as pure agent for certain services in addition to the main supply of motion picture production service, the related transactions will be import of services from the actual suppliers, and the amount paid on actual cost basis for procuring those services will be subjected to IGST at the applicable IGST rate on such services. Manoj Jain, a CA and CS, has been working with IRIS for over 8 years and is currently one of the key subject matter experts for IRIS’ GST compliance offerings. He also has been guiding the clients for GST law related matters. Before GST he was handling US compliance analyzing US financial statements and reviewing XBRL filings for US and India market. He enjoys listening to music and traveling.